As I browse through the web there seems to be some confusion amongst newer Uber drivers. Some people are asking if Uber drivers actually get paid, while others have no clue on how Uber will pay them. So, I wanted to clear this all up. 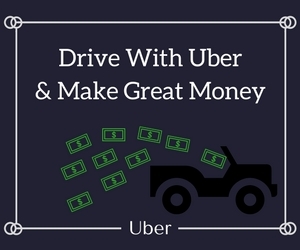 Today, I’m going to explain to you on how to get paid driving for Uber and answer many other questions like how to set up direct deposit for your driver account. There’s no point on driving for Uber if you don’t understand how to get money. Making money with Uber is a very simple process. And then you end the trip. You don’t collect any cash because all the transactions are done seamlessly through the app. You will get a percentage of the fare for each ride request that you complete. There’s A few steps you need to take to ensure you get paid on time after you’ve worked up a sweat doing all of that driving. Step 1.) Log into your Uber driver account through their website. Step 2.) Edit Your Bank account information. If you have a check you can use the routing number and account number on it to update your information. Step 3.) Once you have added your bank account and filled everything out then you just drive and wait until you make some money so you can get paid. It’s simple to set up your account information to make sure you get your money directly deposited into your bank account every week. Yes and no… What I mean by this is they don’t pay you hourly. They pay you per trip requests and the money you receive is a percentage of how much the fare was for the passenger. The more rides you take the more money you make. However, when fares are reduced or a big event/holiday is coming up then Uber will give you a guaranteed hourly wage. This just means if you make less than the hourly guarantee Uber will pay you the difference. The hourly guarantee is different every time and not something I would wait for because you never know when it’s gonna happen. How Do Uber Drivers Get Paid Per Ride? Uber gives you a commission of the fare. It ranges from 70-80% depending on when you joined and where you’re located. For example, if you were getting paid 75% of a $10 fare. Uber would pay you $7.50 for that ride. How Often Do Uber Drivers Get Paid? Uber drivers get paid on a weekly basis. In the 7 months of me driving for them, Uber has never been late on getting me my money. The money has always popped up in my account when I expected it or came even earlier. What Day Do Uber Drivers Get Paid? You get paid first thing every Thursday. It’s a direct deposit that goes into your bank account. There’s even been a few times where I got paid on Wednesday instead of Thursday. What Is Uber’s Pay Period? Uber pays you everything you made the previous week starting from Monday at 4 A.M. to the next Monday at 3:59 A.M. This means you can work Sunday night until 4 A.M. on that Monday and your earnings will be given to you that following Thursday. It depends on the area you live in and how much you decide to drive. On average, among all drivers, Uber states that you make $19.04 an hour which is considerably higher than a taxi. Do remember though, this is before expenses. Even after expenses though, this is a better job than working at Burger King. Here’s our own break down of how much Uber driver’s make, on average. How Does Uber Calculate The Fare? Since you get paid for every trip you take it’s important to understand how the fare is calculated. It does vary city to city so keep that in mind. The basis of it though is Uber charges a passenger per mile that you drive and per minute. There is also a base fare that’s charged. For example, If you were to take a trip that was 4 miles (Charging $1 per mile) and it took 15 minutes (Charging $0.25 per minute) with a base fare of $2.20. Then the fare would be $9.95. And then you would get 70-80% of that amount. There is a safe riders fee that cost $1.35, but this fee isn’t added in the fare that you get a percentage of. Depending where you live the fare cost per mile and per minute could be higher or it could be lower. It’s always nice to make a little bit more money and you can do the same with Uber. The type of bonus Uber gives is if you were to refer a few of your friends to sign up and drive through your referral link. In order to get paid referring other drivers you first must become a driver yourself. In San Francisco, I get paid $300 for every person that signs up through me. Back in November the bonus was higher and I got paid $600 for signing up my friend. If you want to help out just sign up through my referral link so I can get a little extra cash. One driver made $90,000 in 6 months just by referring other people to drive for Uber. Does Uber Take Out Taxes? You are an independent contractor which means you have to take care of your own taxes. Uber pays you the full amount of what you made and then you need to pay quarterly or yearly the money you received for tax purposes. This means Uber didn’t take out income tax, medicare, social security, or any other type of tax that would come out of an employees paycheck. Now that you understand how Uber drivers get paid and how to set up your direct deposit as well. Now it’s time for you to start driving and make all that money! If you have any questions about Uber drivers getting paid then please let me know. Just leave your comments below!